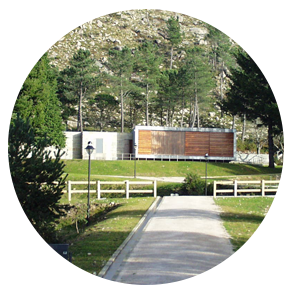 The "Lamas de Mouro Gate" is a structure from the Melgaço Municipality dedicated to the reception, recreation and information for visitors of the Peneda­Gerês National Park (PNPG). Opened in May 2004, this was the first of five "gates" planned for the National Park (PNPG). Corresponding to an area of about 10 hectares, this Gate, whose theme is "Spatial planning", consists of three buildings and several outdoor spaces. During the FILMES DO HOMEM Festival period there will be a scheduling of films at the auditorium of the Lamas de Mouro Gate structure.